It wasn’t until about 10 A.M. that I saw my first corpse, but then again, it was only Monday. I was pretty certain the bodies would grow more plentiful closer to the week’s end. Not that earnestly imbibing revellers were in any form of short supply, of course, including numbers of the overly enthusiastic kind well be on their way to becoming what Münchners jokingly call “Bierleichen,” or “beer corpses.” Yet even with almost every seat in almost every tent taken by merrymakers excitedly waving about their one liter Mass steins, even with the bands blaring full-throttle versions of “Ein Prosit,” the “Chicken Dance” and “Take Me Home, Country Roads,” and even with the party already dialed up to 11, if not beyond, the whole scene struck me as, well, almost subdued. This was, after all, Germany’s famed Oktoberfest, the event to which thousands, no, hundreds of thousands of visitors flock each and every year, in search of fun, frivolity, and of course, beer. This was it, the big one, the beer blast to end all beer blasts! So why did it feel less like the stereotypical frat house party on Teutonic steroids and more like a merely boisterous Bavarian cultural fair? The answer to that ponderous query would come, but not for many hours and numerous liters of beer. In the meantime, I had a carousel to catch. Truth be told, it was by sheer happenstance that I even found myself on the great field known as the Theresienwiese, home to Oktoberfest and known to locals as simply die wiesn. (That’s “vee-sn,” meaning meadow, as opposed to the confusingly similar beer terms weisse―“vice”―and weizen―“vite-zen”―meaning white and wheat respectively.) I had not previously even thought to attend, mainly because the fest always put me in mind of a massively oversized beer hall, and I had visited and much preferred the smaller ones operating year-round across Munich and Bavaria. Or, at least, that’s what I believed. Then I was invited to speak at the Stockholm Beer and Whisky Festival and, employing the patently illogical reasoning of the compulsive traveler, decided that since I was going to be in Sweden anyway, I had might as well pop down to Munich, a mere 1,200 miles away. Which is exactly what I booked, discovering quite to my delight that the three-way flight wouldn’t even cost me that much more than if I had purchased a straight Toronto-Stockholm return ticket. Pity, then, about the lack of hotel rooms. One of the great truisms about Oktoberfest is that it is a cash cow for the city’s tourism industry, with some visitors booking their accommodations for the following year’s edition even as they depart the current year’s festivities. Affordable rooms are snatched up fast―such as they are! A one-star hostelry in the city center can go for 150 euro a night, and by the time I was ready to make my reservation late in the summer, pretty much everything in the city was gone. Fortunately, I had an ace up my sleeve in the form of Augsburg, a charming, mid-sized city less than an hour by train from Munich’s Hauptbahnhof, or central station, and more importantly, somewhere with available hotel rooms. It might not have been the most convenient of lodgings, but it was still a bed and a roof and a place to store my stuff. Which is how I wound up on die wiesn on the night of the first Monday of Oktoberfest, alone and, despite the Konig Ludwig Weissbier I enjoyed on the train―civilized travel indeed!―very thirsty. There were beer tents to explore, of course, but also an interesting-looking merry-go-round near the St. Paul’s Church end of the grounds. I had found the Karussellbar. Accommodating mere dozens of drinkers, as opposed to the thousands who cram the massive beer tents, the Karussellbar is a sort of oasis of calm amid the noise and confusion of Oktoberfest, and one serving Franziskaner Weissbier, to boot! I boarded at the first opportunity, grabbed a glass of fresh, spicy wheat beer and in short order found myself engaged in conversation with a pair of lederhosen-clad Münchners. As we spun in a lazy circle, I expressed my surprise at seeing young men in their twenties wearing such traditional attire, especially on what would appear to be a simple night out drinking. 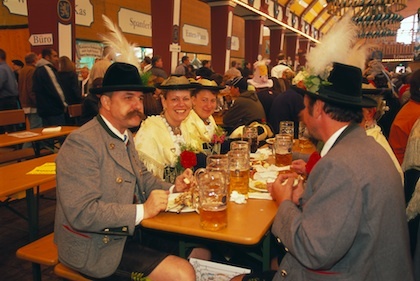 They admitted that it was hardly their ordinary apparel, but added that during Oktoberfest it is common for Bavarians to sport their lederhosen and, for women, dirndls. And when else would they trot out the leather britches, I asked, although not exactly in so many words? “Pretty much only during Oktoberfest,” they replied in near harmony. Finished my half-liter of weisse, I excused myself from the carousel to explore the 70 acres of Therese’s Meadow, so named for the Princess Therese von Sachsen-Hildburghausen, whose marriage to Prince Ludwig I of Bavaria triggered the start of Oktoberfest exactly two hundred years ago this fall. It was on these exact grounds that a horse racing course was built to mark the wedding ceremony, and where the original celebration principally took place. It was also here that Münchners decided to repeat the bash a year later, and for every year since, save the two dozen or so occasions on which Oktoberfest has been canceled due to war or pestilence. Not that the Prince or Princess would recognize much of the grounds today. Rather than a horse track and seating, the modern wiesn resembles more a low-key Six Flags amusement park, complete with roller coasters and Ferris wheels and rides that fling people around in circles for no apparent reason, all complemented by various games of chance and skill, most quite familiar to anyone who has ever set foot on a midway. And in fact, despite the enormity of the beer tents and their pre-eminence in virtually every story about Oktoberfest ever written, it is the amusement park side of the show that visually dominates the grounds. Even at night, the park buzzes with scores of extended families joyfully wandering from place to place, indulging the kids in everything from sweet and savory treats to rides evidentially designed to extract said foods from their stomachs. Not being a person much interested in amusement park rides, however, my attention span for such things was sorely limited. It was high time to hit the beer tents! As I entered my first tent, the Hacker-Pschorr-fueled Bräurosl, I was, as I often find myself in Germany, longing to get a full Mass into my hands. Not so much for the liquid contained therein―although naturally I was interested in that, too―but for the feel of the thing, the weight and density of the glass and the sense of “Bavarian-ness” it always seems to convey. Like the traditional British pint and the stange of Köln, I have always been of the mind that the Mass is more than almost anything else emblematic of the German south, and somehow don’t feel I have truly arrived until I again experience its familiar, weighty pull on my forearm. Bräurosl was not to be the point of my symbolic arrival, however, as there appeared to be not a single empty seat among the 6,220 gathered within its confines, and the tenet of “no seat, no service” is as close to gospel as it gets at Oktoberfest. It was apparent that I would have to venture elsewhere for my introductory festbier. Deciding to be methodical in my meandering, I wandered from the Bräurosl only as far as next door, which conveniently enough put me at the entry of Augustiner-Festhalle, which not only features the beer of one of the last two independent breweries operating in Munich―the other is Hofbräu München―but is also reputed to be the friendliest tent on the grounds. And sure enough, everyone was quite friendly when they were telling me I couldn’t sit there! Two tents down and still no Mass, still no beer, still no sense of belonging. I was becoming rapidly discouraged, not to mention parched. Sure enough, though, the third time did prove to be the charm and I found myself a seat in the Ochsenbraterei, also known as the Spatenbräu-Festhalle, having been drawn to its door by the large-as-life papier-mâché ox slowly rotating slowly above the entry. (And yes, the depiction is more than symbolic; the Ochsenbraterei’s main claim to fame is its spit-roasted oxen meat.) I was seated among more visitors than Bavarians, but to trot out another tired cliché, I felt that as very much the beggar, I was in no position to be a chooser. Beer in hand, smile on my face and crazy Japanese doing their best imitations of Bavarians to my right, I felt I had finally arrived. I was also, by the middle of my second liter, beginning to get tired, and with a good amount of travel already under my belt that day, decided to put my Oktoberfest experience on hold for the time being and catch the next train for Augsburg. Returning the next morning, I found a not surprisingly much less crowded wiesn, in part owing to the earliness of the hour, of course, but also because of the low clouds and steady rain that had settled in over Munich. Lucky for me, though, since low attendance translated into ample opportunity to try the various beers on offer, even if my “tasting samples” arrived in one liter portions at the cost of about 8 euros apiece. Only six breweries participate in Oktoberfest, the previously mentioned Augustiner and Hofbräu, plus Hacker-Pschorr and Paulaner, both owned by Heineken, and Spaten (including Franziskaner) and Löwenbräu, each owned by Anheuser-Busch InBev. Which for many begs the question of why others in the area, including the excellent Andechs and the brewery owned by Prince Ludwig’s descendent, Kaltenberg, are barred from participation. While the true answer to that query is anyone’s guess, it is likely that politics and finance are involved in equal parts. Oktoberfest is big business, with millions of liters of beer dispensed and tens of millions of euros spent and recouped, so the pressure on all parties to maintain the status quo must certainly be immense. It may not be fair, but this “closed family” of Oktoberfest seems unlikely to change any time soon, regardless of how much foreign ownership is involved. As for the beers, they are what might be recognized as märzen in only the broadest of possible senses. Michael Jackson, in his New World Guide to Beer, depicts the traditional Oktoberfest beer as “medium-strong, malty, amber-red, translucent,” only two of which adjectives could reasonably be used to describe what I was drinking. With alcohol contents approaching 6 percent, they were indeed medium-strong, and certainly translucent, but only the most color-blind would call them amber-anything, and while maltiness is certainly more a subjective element, it wasn’t the first descriptive that sprang to mind as I sat supping in the oddly quiet and only moderately busy tent. Still, not one person I spoke with, local or international, complained at all about the beer, and truth be told, I was not at all disappointed myself. Knowing what a theoretical märzen should taste like is one thing, while drinking Mass after Mass of the stuff while in the full throws of Oktoberfest is quite another, and no matter what evaluations one might put forth after a more cautious sampling, if ever there was a situation in which context makes the beer, this is it. And so, fortified by half a chicken and some ox meat, I tent-hopped and drank and socialized, ultimately hooking up with a group of Californians even as the rapidly multiplying table reservation signs threatened to squeeze us out the front door. Which is when it finally dawned on me what was missing from my preconception of Oktoberfest the day before. In envisioning the festival as a tourist trap populated by travelers in varying states of intoxication, I had, I realized with a start, gotten it utterly wrong. Reviewing my experiences, it all seemed so clear. The special occasion lederhosen, the families with strollers touring the midway, the reserved tables marked with the names of eminent corporations, the be-suited businessmen: These were the things that marked Oktoberfest as the folk festival it really is! The reason it had felt on my first night like a Bavarian cultural fair is because that’s exactly what it is and has always been. Sure enough, back in my Augsburg hotel room the next morning, following a late night train ride with a wide variety of corpses, a quick Google of Oktoberfest statistics revealed that almost three-quarters of visitors each year are Bavarian, with only about 15 percent comprised of international visitors. 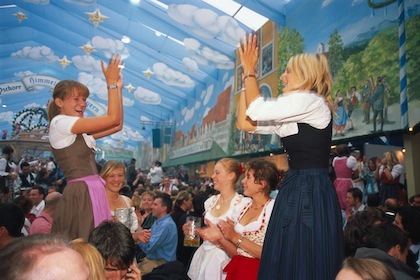 Oom-pah-pah’ed versions of John Denver tunes and changing beer styles notwithstanding, Oktoberfest is simply a Bavarian bash to which they have generously invited the rest of the world, and we should consider ourselves astoundingly fortunate that they have.